When I purchased this book, the cashier said, sarcastically, “Nothing like some light summer reading.” She was right. There’s nothing light about Crime and Punishment in terms of plots or ideological conflicts. The book is the equivalent of eating a brick. However, I never expect to pick up anything written in the nineteenth century and find it to be light and airy. As my mother would say, C&P reads “like a Russian novel,” meaning there are too many characters and too many lines of action to conveniently follow. Originally, Crime and Punishment appeared as a serial in a periodical, as was the style for nineteenth century novels. I was unable to find a visual of the original serialized edition, but a lot of serials had pictures and even recaps to get you back into the story or help you out if you missed an issue and, consequently, a segment of the plot. Hence, reading works like C&P in novelized form (or in my case, the $6.99 “Bantam Classic” edition with small print and no margins) is not how contemporary audiences consumed them originally. As Poe put it, a novel is of “undue” length and excites the readers for “too prolonged” a period [paraphrased]. Both are true of this novel, but it doesn’t necessarily ruin the experience. 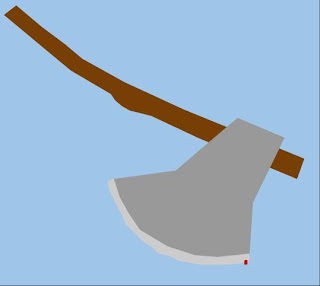 The so called climax comes in the first act, where Raskolnikov, our anti-hero protagonist, murders an old pawnbroker and her peddler sister (who walks in unexpectedly during the murder) with a stolen axe. He’s able to escape, despite being detected, and retreat back to his apartment. His panic, which he was sure would be controllable due to his extensive preparation for the crime, not only causes him to flee without stealing the lion’s share of the pawnbroker’s wealth, but also puts him into a state of delirium after the crime which nearly causes his arrest. By chance, his crime is not discovered, and he is not immediately suspected. There in lies the surprise of the novel. This will not be a detective story so much as a deep introspection into the workings of a criminal’s mind. The reader will be teased with variations on motives, and will try to understand why the criminal did what he did as opposed to discovering the criminal and ending the story with an execution. The storyline suggests a shift in opinion as to nineteenth century thinking: now that reason dominates over divinity, how can we explain how the world works and what motivates men’s actions? The introduction by Joseph Frank tackles the theoretical workings of the novel by analyzing Dostoevsky’s life and circumstances when authoring the text, but leaves untouched the radical shift from the divine to the secular explanation of society and individual actions. No longer are people tried by a priest or accused of demonic possession: corporeal motives are the root of men’s transgressions against authority. The atmosphere of C&P is deeply introspective and psychological in nature. As Frank points out, despite the third person narration the book delivers intimate details of Raskolnikov’s thought process, even including (seemingly as an extension) other characters’ perspectives on Raskolnikov’s state of mind, and making excellent use of aposiopesis which results in poignant pauses that allow the reader to mime the thought process of the characters, essentially having the reader think what the characters’ considered unthinkable, all the way to the book’s chilling final conclusions on motivations and actions–the work of a skilled author. There are political and social implications as well, which a historical analysis would illuminate, but this is summer, and I am not interested in doing that right now; Frank’s introduction to the Bantam Classic edition also discusses these aspects at lenght. I will say that having read very few Russian authors, this book inspired me to take another look at Tolstoy or Turgenev. Due to the heavy nature of this book and the amount of time it took me to read and jump back into the plot (having put it down for days at a time) I am going to try to hit up some lighter works with my remaining pleasure reading season. Note: For books and longer readings, I feel the 0-10 point rating system is a little reductive, especially since the time commitment is much higher. I am going to, therefore, use the following pompous scale: not recommended, highly recommended, required reading.